Strategy as Business Insurance | Macleod & Co.
As a business owner, you are constantly making decisions about how to manage your time and resources. It can be difficult to make room on the calendar or in the budget for planning and strategy development, but the truth is strategic planning is a must. Whether it’s sweat equity or capital outlay, strategic planning is the single most important investment in the future of your business. It should come before product improvements, before office space — especially before promotion or customer service. 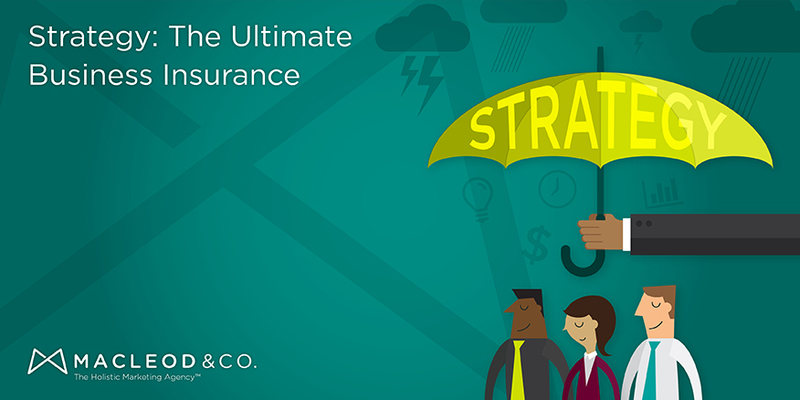 Strategic planning is an insurance policy for your business. Without the discipline of strategy, entrepreneurship leads to chaos. Chaos is expensive. Passion by itself does not have the power to organize efficiently. Without organization, activities and decisions will move full-force in any direction that seems right at the moment. The original vision will become mangled as a result of over-interpretation. Things will happen in the wrong order, not at all, or twice. You will spend more than you need to, and you won’t know how much, or why. Apply strategic planning to entrepreneurship and suddenly you have a very powerful combination: passion and discipline. The passion is innate; the discipline gives it structure and allows your vision to be communicated to others in an actionable way. Who are we? Why do we exist? Who do we serve? How do we do it? What makes us better at it? What do we value as an organization? Questions like this are often dismissed as overly sentimental or immaterial, but they’re fundamental to the success of your venture. You probably know the answers, but your staff may not. If you need to build a brand, this should be your first step. Who else does this? Why do they exist? How do they talk about themselves? Who do they talk to? How do they do it? What are they really good at? This is competitive analysis. Don’t dismiss your competition, even if you think you don’t have any. There’s always something you can learn from them. Who wants this? Why do they want it? Do they know they want it? What would make them want it? What do they care about? How can I help them? Knowing your customer is key. Listen closely, and they’ll tell you a lot about themselves. Seek that information and build metrics into your strategic business plan to collect it — overtly or covertly. Social media, customer service, trade journals — the information is out there, you just need to know how to obtain it. A strategic plan can also be seen as a framework for data collection and learning. Chances are, some form of “continuous improvement” is among your organizational values, and that can be systematized in strategic planning. What do our customers say about us? What does our competition say about us? What are our customers saying about our competition? The answers to these questions are important for marketing, as well as product development. Listening to what customers are saying about your competition can be a predictive measure — it provides you with real-time information you can use to inform and adjust your strategy. How many return shipments did we get last quarter? How many incorrect orders? What’s our average time for delivery? Questions like these are also essential to continuous improvement. What gets measured gets fixed. If you identify a problem, do some digging and get to the source of the issue. If shipments are slow, how is internal communication? Is there a printer acting up somewhere? Are there training issues? An organization committed to learning naturally evolves to become a self-improving organization. Business problems can be insidious and tend to sneak up on you without warning. Be prepared and establish a strategic plan that defines who you are, what you do, how you do it, who your customer is, and how you will deliver and promote your product or service. Let your strategic plan be your conscience and your guide. Developing a strategy as business insurance is the best way to guarantee future success. Interested in free resources to help you get started on your strategic plan? Check out Ignition ™ — Macleod & Co.’s flat-fee marketing strategy package. Each of the following pages offers free resources to help you take those first steps toward strategizing your business. Originally published on Startup Beat. About the Author: Tanya Korpi Macleod is the founder of Minneapolis-based Macleod & Co. After more than 25 years of marketing and advertising experience in the U.S. and Europe, Tanya noticed the chasm that often exists between an organization’s theoretical marketing “plan” and its realistic ability to execute it. This led her to pioneer in the concept of “holistic marketing,” which redefines marketing as the complete process of bringing a product, service or company from inception to maximum ongoing profitability. Her mission is to show organizational leaders that a holistic mindset not only promotes a healthier culture, but a more profitable business. Infographic: Ignition from Macleod & Co.